Chosen the $9.99 weekend lunch special, then blown $5 on a glass of wine? Got a cheap flight, then spent twice as much on car hire? Spent a few dollars on a cheap and cheery present, then $4.50 on a greeting card? We’re all guilty of it. I’ll make an effort to bring my lunch to work, then — without really thinking about it — buy a drink from a deli that I could have bought from the supermarket for a fraction of the price. Rosie, a MyBudget team member, brought this issue to my attention. She’s coined a great term for it: complementary costs. These are hidden costs that we often don’t think about. That doesn’t mean that you should never splurge. Sometimes we choose the cheaper option (the lunch special) so that we can afford a little indulgence (a glass of wine.) 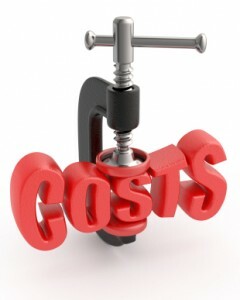 But sometimes, we rack up complementary costs out of convenience or lack of organisation. Over a year, I could potentially save a few hundred dollars by buying my lunch drinks in bulk from the supermarket. So what can you do to reduce your complementary costs? Rosie says she lives by the MyBudget motto to think yearly. Greeting cards are a good example. Rosie says that she buys discounted $1 greeting cards when she sees them on sale. She estimates it saves her over $100 a year. Another option would be to make your own cards. If you’re going to the movies, bring your snacks from home. Instead of buying bottled water, buy a reusable bottle with a filter. If you need shoes to match a special occasion outfit, ask friends if they have a pair you can borrow. Rather than buying take-away coffee, invest in a travel mug and make your coffee at home. Buy all of your lunch supplies at the supermarket. If you’re prone to using vending machines for drinks and snacks, keep a back-up supply in your desk drawer. When you’re planning a holiday, take all of your costs into account. Discounted flights might be tempting but, when everything is accounted for, perhaps it's cheaper to drive.